> Mazda MX-5 fights Toyota 86. Which is a better drive? 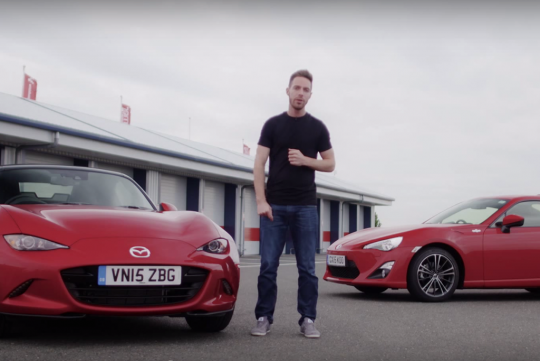 Mazda MX-5 fights Toyota 86. Which is a better drive? If you are in the market for a two door Japanese sports car, chances are it would either be the new Mazda MX-5 or the Toyota 86. Being the new kid on the block, EVO U.K. took the new ND-generation MX-5 out onto the track to see how much fun it can be. As a benchmark and one of its closest rival, Toyota's well-acclaimed 86 is added into the review to see how they compare against each other. So which is more fun to drive on the track and which one is actually faster round it? With the MX-5 almost 200kg lighter than the 86 which in turn has almost 40bhp more than its rival, this might be closer than you think.